With this free Streamer Video Template For Bands #1 Simple Brutalizer, you’ll be able to high quality animated streaming video for your song in just ~5 minutes! Download streamer video template, customize with your music, track and logo. Render and it’s ready for release on youtube / facebook / vimeo / whatever. 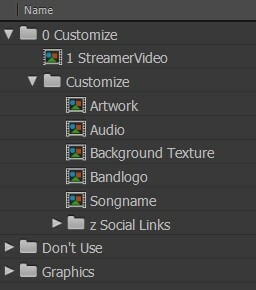 No more questions like “how to make a music streamer video for a song” or “how to create simple streaming video for music track”. No more wasting time on struggling with After Effects. Streaming video production for bands has never been so easy! Just download our Streamer Video Template #1 Simple Brutalizer completely free and make a similar style animated streamer with YOUR background, YOUR track name and for YOUR audio! Tutorial: Metalcore Lyric Video Template #3. Step-by-step Customization. Just customize all these compositions with your Audio track, Songname, Artwork and etc.. and change the background (if you want, it’s not necessary) into After Effects. Choose the length of your video (as your audio). Render it for youtube/vimeo or whatever. If you need to change the color, just change the color on this compo with “Fill” controller. And then change “Hue/Saturation” effect controls for Social Icons line and for “Flare” composition. That’s all!